I listen to your programmes, thank you. I have many health problems, including Parkinson’s Disease. But I am not discouraged because I follow Jesus Christ our Savior and Great God. Thank you for your encouragement. I believe in God because I came to the end of myself. For some time I could not walk. All I could do was pray and be thankful. Then I walked again. Now, when I leave the house to look after the cows, the others in the village call out “Can you walk now? Where did you go for treatment?” I tell them Jesus healed me. Then they say “What do we have to do to get this kind of healing?” I tell them they don’t have to do anything, only open their hearts to Christ, and believe that he is able to help them. 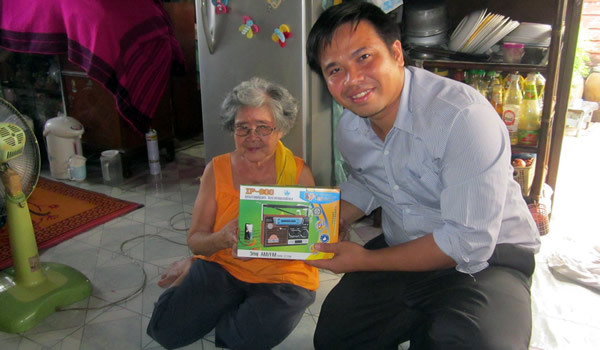 Mrs P lives in Chachoengsao Province and is enrolled in our Thai Bible Correspondence Course. Your support allows us to produce programmes and do follow-up correspondence and discipleship. Thank You.